After driving by this sign dozens of times, my curiosity got the better of me and I finally decided to drop in and meet Bob. Within 60 seconds of meeting me, Bob had clearly explained his qualifying criteria and was headed back to fix a boat motor—a Mercury, to be exact—for a paying client. No wonder he’s been in business for three decades. So what’s this got to do with selling professional services and Accountable Growth™? Wasting time, money and resources chasing clients and work that are not a good fit—and both would fall into Bob’s category of “deadbeat”—is one of the biggest errors many professionals make. These same professionals seldom win RFPs (one in five is a common win rate, and many are worse! ), they often fail to differentiate and compete on fees and then have trouble getting paid and expanding the relationships they do win. No kidding! Figure out what your ideal clients look like. Determine how to reach them. Succinctly articulate your qualifying criteria. Get to work serving those who are a good “fit” with what you’ve got to offer. Say “no” to everything else. Be like Bob, avoid deadbeats, and you’ll be as popular, and sustainable, as he is. Welcome to my first blog. Here I will share some lessons and inspiration that lead to Accountable Growth™. My target audience is professionals. If you’re technically outside this group, you may still find something in it for you. Maybe you’re looking for ideas to keep things fresh and interesting. Maybe you’re working at changing your own behavior, or somebody else’s. Maybe you need to break down silos that have built up over time or climb a mountain you’ve not yet summited. If any of these descriptions sound like you, please check out the blog. We’ll periodically populate it with real examples of growth ideas that have worked and can be applied almost anywhere. Your comments are always welcome, as are your private messages. A great site, you really are an impressive chap Dennis. Nice blog. Thanks Kevin. A work in progress, to be sure. Your work developing the concept of a Strategic Account Manager as “Political Entrepreneur” was an early inspiration to me – I see it in action every day! Now you need to repower that boat with a Mercury engine! Thanks Mark. Top performers have a habit of being very selective about how they spend their time. They perfect what they do, then do it repeatedly – but predominantly for clients who are an excellent fit. An Accountable Growth trait, for sure! 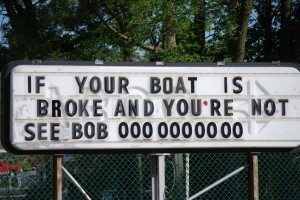 Dennis, I was checking out your website and I too have seen and remembered Bob’s sign. I have had a few walk-in prospects lately that wanted something in fitness services other than what I want to offer. I often get trapped into spending too much time with them when I knew that we were not a good fit after the first minute of our encounter. I should know better, but perhaps I need “accountable growth” coaching to avoid these errors. Thanks Brian. As my personal trainer for the past 12 years, you have drilled into me the value of being accountable for my behavior (specifically eating smart and working out methodically). You have relentless expectations and I hurt after every session. After wandering occasionally, I always return to you, my coach, because you help me get results I never achieve by myself. Maybe it has something to do with your life-long commitment to your field – and your passion for sharing what you know works. It is rewarding to have a coach who has “earned the right” and gets results. Thanks again! Previous Previous post: 16 Appointments; 6 Engagements… One Hour’s Work!